Home » Guide » VIN Number » What is a VIN Number? All vehicles being sold in the United States of America are required to have the 17-digit identification code known as VIN number, in order to efficiently identify them. The VIN is uniformly created according to its manufacturer, year of creation, model, country of origin, and more other things. Manufacturers have used the VIN since 1954. Prior to 1981, there wasn’t a standard format for VIN. Every automotive manufacturer had their respective VIN standard. In 1981, National Highway Traffic Safety Administration (NHTSA) standardized the format of VIN. Where is the Vehicle Identification Number? The typical location is on the lower left corner of the dashboard just in front of the steering wheel. Check it through the windshield. Front area of the engine block. To easily find it, just open the hood and you will see it etched in front of the engine. The rear wheel, directly above the tire. Within the driver-side doorjamb, usually underneath the side view mirror. At the driver-side doorpost, parallel to where the door latches. VINs are also placed on legal documents such as the insurance card or policy, on the vehicle title and registration, body shop records, just to name a few. You can find detailed guides on how to locate your VIN based on your vehicle type on our site by clicking on this link. 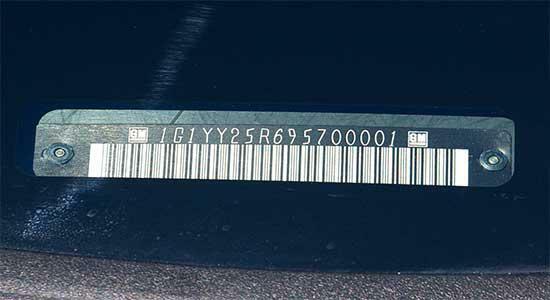 How is Vehicle Identification Number Useful? To help law enforcement agencies to easily locate a stolen vehicle or parts. To ensure that the Department of Motor Vehicles can track ownership. To help manufacturers know which vehicle needs to be upgraded, recalled or replaced after a probable production mishap. To ensure that you are getting the appropriate vehicle parts and services. To track down the records of engine failure if you are planning to purchase a previously owned vehicle. What can I do with a VIN Number? The VIN is surely efficient in deterring probable theft, preventing usage of unmatched vehicle parts, and recovering stolen vehicles. It also helps potential vehicle owners to find well-built models and avoid lemons. You can feel free to decode a VIN with our VIN decoder.